The Safed Sugar Suite, opened in 2013, is a two-bedroom apartment minutes from the heart of Safed. If you are looking for a clean affordable apartment in Safed, the Safed Sugar Suite is the place for you. Location: Filled with light, the clean, airy two-bedroom apartment is located in Givat Shoshana, a short 7 minute walk from the central bus station and 5 more minutes after that you are in the center of Safed, close to the galleries, synagogues and dining. We have plenty of parking. There are 50 steps from the parking lot to the apartment so unfortunately it is not handicap accessible. The good thing about being so high up is the incredible view! The Rooms: The Safed Suite has a private entrance which opens up to a salon. You can see the Kinneret in the distance as you come down the walkway. The salon has a comfortable couch that can sleep two. Open the sliding glass doors to sit on the balcony and gaze at the sunset, make a barbecue, see the lights of Tiberius in the background. Off the salon is a full kitchen, with a stove, oven, microwave, full fridge and a toaster oven for dairy. All Shabbat amenities are available, including an urn for Shabbos, a blech, tea lights etc. The parents room has two single beds, with American style mattresses. The second room has four single beds and a fifth mattress could fit on the floor for larger families. Altogether there are eight beds. The bathroom has a bathtub which is convenient for small children. And of course there is air conditioning and heat. WIFI is free! While you are on vacation there is always the feeling of wanting to share your adventures with those back home. With free WIFI you can catch up, do your work or give the kids the chance to relax and watch a movie while dinner is being prepared around the corner. Rates: Rates range from 400-700 shekels per night, depending on season and number of people. Children aged two and under are free. Cribs available upon request. Bonus! Free family photo and a calendar. Jodi is a professional photographer and her artwork adorns the walls. As a guest you receive a free calendar and a family photo can be emailed to you. 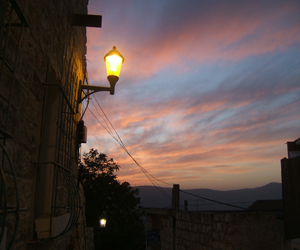 Make the most of your time in Safed. Jodi is also available to take you on a kabbalistic photographic walking tour of Safed, taking you to the key tourist sites like the candle factory, the Ari and Abuhav shuls, the artist row and the Citadel and she will show you where she shot her famous doorways pictures and sharing mystical concepts of Judaism along the way. Catering: Breakfast is available for 40 shekels per person. In addition if you want healthy Shabbos meals they can be delivered from the finest restaurants in town. Sushi, stir fry, healthy, sugar free deserts and more. Call Pnina Sugar at 0504-772-771 or the US line 773-295-7473. Email: [email protected] or the Safed Sugar Suite website.